Simple New Mexican cuisine is the specialty at this family-run restaurant in Albuquerque's North Valley. Breakfast, Lunch & Early Dinner Mon.-Sat. 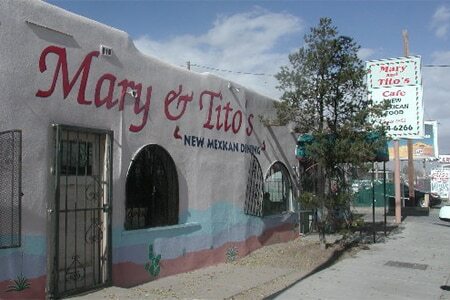 : A fixture in the North Valley since 1963, Mary & Tito’s Cafe isn’t merely still going strong --- it’s going incendiary. Antoinette Knight carries on the legacy of her parents, Mary Ann and Tito Gonzales. Long the secret of loyal locals, the restaurant has been “discovered” beyond state lines --- though the cooking remains as utterly pure and simple as ever. The exemplary red chile (with or without beef) smothers just about everything here from omelets to tamales to the fresh-tasting chile rellenos; equally famed are the carne adovada, chicharrones and savory stuffed sopapillas with sides of refrieds done right. For dessert, there’s Mexican wedding cake. The only downside --- besides the early closing time (between 6 p.m. and 8 p.m. depending on the day) --- is that you can’t cool your heels (or your satisfyingly singed palate) with a beer: no alcohol is served here.